"Sampath Speaking" - the thoughts of an Insurer from Thiruvallikkeni: winners of Wimbledon 2018 and something interesting ! winners of Wimbledon 2018 and something interesting ! Wimbledon 2018 is over ~ not many would have guessed its winners ! Epic semifinals, marathon matches, the return of the legends, World Cup drama -- Wimbledon 2018 had it all and more ~ here is a photo of Single champions dancing together ! In the Women’s section, Angelique Kerber was so steady, so patient, so accurate throughout the Wimbledon final. She never really gave Serena Williams much of a chance. Kerber won her first championship at the All England Club and third major overall by playing cleanly as can be and picking her spots for big shots, beating Williams 6-3 6-3. "I knew that I had to play my best tennis against a champion like Serena," said Kerber, the first German woman to win Wimbledon since Steffi Graff in 1996. Kerber made only five unforced errors the entire match, 19 fewer than Williams. Perhaps more impressive was this: She broke Williams in 4 of 9 service games. The 30-year-old German lost to Williams in the 2016 Wimbledon final. She beat Williams in the Australian Open final that year, then won that year's US Open to briefly replace her at No. 1 in the rankings. Kerber addressed Williams during the on-court interviews, saying: "You're such an inspiration for everybody, for all of us. I'm sure you will have your next Grand Slam title soon. I'm really, really sure." The final started more than two hours late, because they had to wait for the end of Novak Djokovic's five-set victory over Rafael Nadal in a men's semifinal that was suspended the night before. It is so famous that the balls are known World over as Tennis balls. Part of the longest partnership in sporting goods history, Slazenger has been the Official Supplier of tennis balls to The Championships since 1902. Yellow balls used for first time in 1986. 53,000 used during The Championships’ period. Stored at 68 deg F. New balls after first seven games (to allow for warm-up), then after every nine games. Subject to availability used balls are sold daily. £2.50 per can of three. Proceeds go to the Wimbledon Foundation. At start of day 48 tins are taken onto Centre and No.1 Courts and 24 on all outside courts. In the Men’s – it took Novak Djokovic five minutes to break Kevin Anderson’s serve, but he could not break his admirable spirit over two hours and 19 minutes in a Wimbledon final memorable only for the South African’s dogged but doomed fightback. Anderson, troubled early in the match by a sore right elbow, was forced to endure one of the most gruelling afternoons of his career but Djokovic suffered too, swearing at the crowd as his frustrations consumed him before he secured his 13th grand slam title, his fourth here, winning 6-2, 6-2, 7-6 (3). The sun-bathed Centre Court audience can hardly have imagined when they bought their tickets that they would not be seeing either or both of Roger Federer and Rafael Nadal contest the final. Anderson beat Federer in an excellent quarter-final, Djokovic saw off Nadal over two days in the second semi-final. Shattered after surviving six hours and 35 minutes against John Isner in the first semi-final on Friday, Anderson – the 2017 US Open runner-up – refused to surrender in his second major final and dug deep to make a fight of it in the third set, although it was still a poor spectacle. The longest rally of the match lasted 15 shots, as Anderson strove to hold serve at 0-2 in the second set. There were the usual sympathetic cheers when he managed it, but pointlessness and inevitability hung heavily in the suffocating air. In our school days, the fighter John McEnroe not only played Singles, but soon after the finals would be in action pairing with Peter Fleming in the doubles finals as well. Peter Blair Fleming won 52 titles, of which seven were at Grand Slams (four at Wimbledon, three at the US Open). Then there was Peter McNamara and Paul McNamee, the Australian Wimbledon champions and delightful pair. It is the era of Bryans ! ~ as is his habit, Mike Bryan walked into a news conference at Wimbledon on Saturday and identified himself to the stenographer, so he could be distinguished from his partner. The Bryans have spent their career setting doubles records together, Bryan played 76 consecutive Grand Slam events with his twin brother, Bob, and won 16 of them. but with his victory alongside Jack Sock at Wimbledon, Mike Bryan now finds himself sharing one with someone else. This year’s win was Mike's 17th Grand Slam doubles title, his first since 2014 and his first with a partner other than twin brother Bob Bryan. This time, however, it was in jest. Bryan had just won the men’s doubles title with Jack Sock, and it was his first major championship in that event with a partner other than his identical twin, Bob. Bryan and Sock defeated Raven Klaasen and Michael Venus, 6-3, 6-7(7), 6-3, 5-7, 7-5. It was Bryan’s 17th Grand Slam men’s doubles title, and his first since the 2014 United States Open. At 17, Mike Bryan now sits in a tie with John Newcombe for most Grand Slam titles in men’s doubles. Mike has had to find other partners since Bob has been off with a hip injury, and had been unsure whether he would even play Wimbledon. After a first-round loss at the French Open with Sam Querrey, Mike had rued playing without Bob, and spoke as if he might have just played his last match, saying farewell to reporters. He said the opportunity to play Wimbledon for what could be his last time kept him going. In the Women’s Doubles - Krejcikova and Katerina Siniakova, both 22 from the Czech Republic, won their second successive Grand Slam title with a 6-4, 4-6, 6-0 victory over Kveta Peschke and Nicole Melichar. As well as becoming the first pairing since 2003 to win the French Open and Wimbledon back-to-back, they also became the first to claim both the girls' and women's doubles titles at the All England Club, after winning as juniors in 2013. In the mixed Doubles, it was not quite the ending Jamie Murray and Victoria Azarenka wanted but they enjoyed their run to the final of the mixed doubles so much they might just do it again. 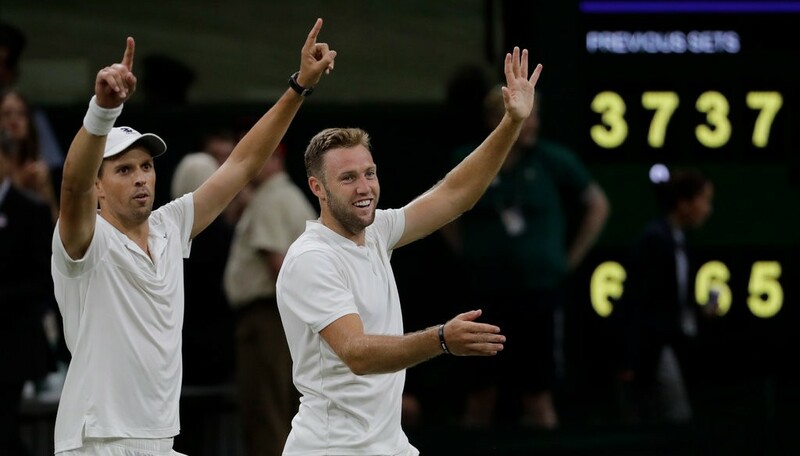 The unseeded pair, who decided only at the last minute to play together at Wimbledon, were beaten 7-6 (1), 6-3 by Alexander Peya of Austria and Nicole Melichar of the United States, the No 11 seeds, who each won their first grand slam titles of any kind.